Insert one in each corner casting to make your container mobile. 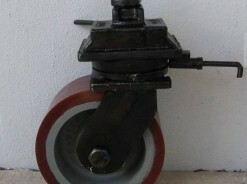 Easyroll’s container castors provides a high strength swivel section that will swivel easily under heavy loads. Polyurethane wheels feature a higher capacity material than rubber, longer wear, and will not damage your floors like cast iron or steel.